Combine cornmeal, stock + lime (zest and juice) and heat in a small pan over medium heat, bring to a boil and keep stirring. Keep stirring the polenta until it’s thoroughly combined and pieces begin to pull away from the pan. Meanwhile mash the sweet potato flesh until smooth and add this to the polenta mixture. Add lime juice + zest and continue stirring until everything is throughly combined. Add extra water if necessary. Use a baking tray with a baking sheet (brushed with olive oil) and put the hot sweet potato & polenta mixture onto the sheet, using a spatula. Spread it evenly, approximately 1 cm thick. Make sure both sides are smooth, use some water and the back side of a spoon for the upper side. Let it rest until cool and set (± 30-45 minutes). 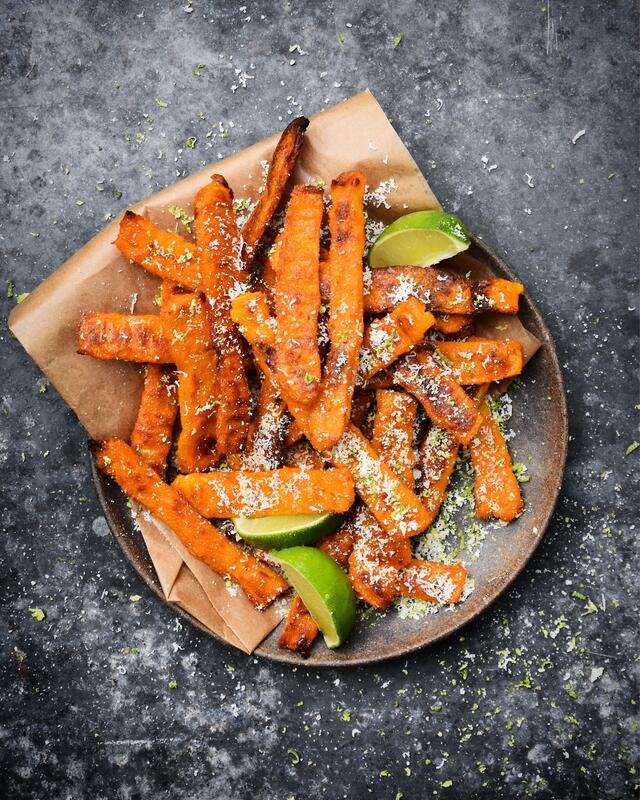 Cut the sweet potato polenta into ‘fries’ and bake in vegetable oil until crispy and golden brown (this may take a while). The outside will be super crispy and the interior super creamy! Add extra lime zest and parmesan to taste. Serve with truffle mayonaise!